Spring has finally sprung and as the days begin to get longer and the temperatures rise, We’re sure that like us, you are eagerly anticipating another wonderful golf travel season! 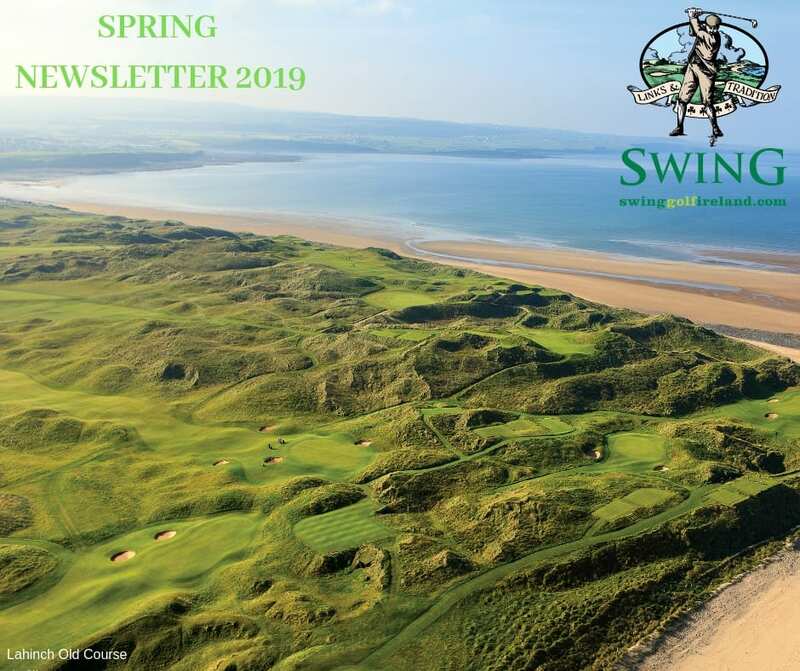 Read on to find out about all that is happening with SWING golf ahead of a year that will live long in the memory for golf in Ireland. With the much awaited Irish Open at Lahinch and Open Championship at Portrush, 2019 has seen huge demand for travel to Ireland once again. Availability is limited at this stage, however we can advise that spaces do remain at some of the countries premier golf courses on select dates. So as we always say it is never too late. If you are planning a last minute trip we strongly recommend that you get in touch with us as soon as possible. Looking ahead to 2020, with the above professional tournaments landing on our shores this year, Ireland will be displayed to a greater international audience then ever before which will no doubt increase requests for 2020 trips. Along with it never being too late to book, we firmly believe that it is never too early to start planning a trip, particularly in the case of 2020. Some of our member clubs are hard at work to further improve their visitor experience ahead of the start of the season. The famed Old Course is currently undergoing an upgrade on its irrigation system. New wells have been brought on line which increased pumping capacity sixfold. There will also be full fairway irrigation on both courses along with tees,greens and pathways. Fairways have also undergone extensive reseeding and on course signage has been replaced. These significant course updates along with a remodeled professional shop for the new season are sure to further enrich the visitor experience for your next round at Ballybunion Golf Club. Preparations for the 2019 Dubai Duty Free Irish Open are on-going as Lahinch Golf Club prepare to welcome some of the top golfers in the world to the South West of Ireland. A strong field is coming together with the likes of Danny Willlet, Tommy Fleetwood, Lee Westwood and Shane Lowry all confirmed with more stars, wanting to acclimatise to links golf ahead of the Open Championship, sure to join in the coming months. 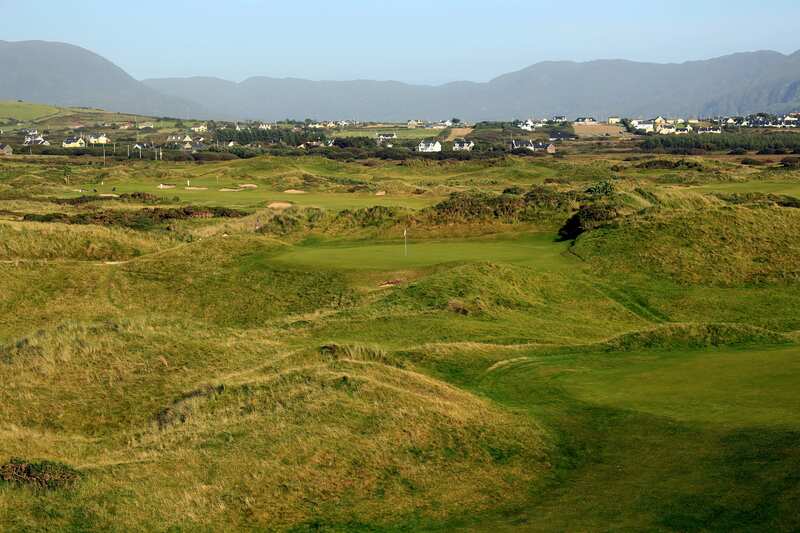 Tralee Golf Club are also committed to making improvements both on and off the course. At present work is being done on the 1st hole. The entrance onto the tee complex will consist of a cobble lock pathway leading you to the new tee complex . You are then met with beautiful visuals of the sea and islands in the distance. The front of the green is also reshaped discreetly to allow a golfer run up a ball if they visualise that sort of shot. After your round on this majestic Arnold Palmer designed links you retire to a clubhouse whose modern, elegant interior design will create the perfect setting to reminisce about a round including one of the very best back 9’s anywhere in the world while you enjoy a hard earned pint. Waterville Golf Links are finalizing phase two of an extensive clubhouse, golf shop and dining area renovation that started in 2017. On the links, they are continually investing in sand and fescue seed, with the goal of enhancing the purity and firmness of the links turf to produce the finest true links playing conditions. Assuming all goes to plan these redevelopments are set to be completed in late April or early May before the busy season commences . The changes to rules of golf have caused widespread debate among the golfing community. Below we have recapped some of the main points to note. We have also included an informative video from the R&A listing the must-know changes. 1. There is no penalty if you accidentally move your ball or ball marker on the green. Put your ball back and you’re good to go. The same applies if you’re searching for a lost ball and mistakenly move it. 2. You can repair everything on the green, including spike marks. You can also touch the line of your putt with your hand or club so long as you’re not improving it. 3. Golfers have just three minutes to search for a missing ball rather than five. 5. You’re free to move loose impediments and ground your club in a hazard, now called a penalty area. You can remove loose impediments in bunkers too, although touching the sand is still prohibited. 6. Now you can play a club that has been damaged in any fashion. 7. A double hit is no longer a penalty. Hitting a ball twice with one swing counts as only one stroke. 8. There is no longer a penalty for hitting a flagstick left in the hole while putting on a green. St Patrick’s Day – Cúpla focal! As you know this weekend will see Irish people the world over celebrate our national holiday of St. Patrick’s Day. With that in mind we thought it might be helpful to provide you with some Irish phrases “as gaeilge” in our national language. We wish you luck trying to pronounce some of these! Meaning – Good Morning ? Usage – When trying to get the last member of your 4 ball out of bed for an early start! Usage – Depends on your golf Swing!!! Wherever in the world you are celebrating we wish you a fantastic St. Patrick’s Day and we hope you can raise a pint of the black stuff and say sláinte in honour Ireland.